Cloonacastle Estate, which dates back to 1238, became the new home for Ballinrobe Golf Club during its centenary year in 1995. A mature 300 acre estate provides the setting for an ever evolving, continuously maturing, magnificent championship parkland golf course. Ballinrobe Golf Club was laid out and designed by the well known and late Mr Eddie Hackett. The course is a true championship test playing a par 73 for the gents measuring over 7,300 yards. A 250 year old Estate House and some of its original farm buildings, have been carefully and tastefully renovated to provide modern clubhouse facilities. 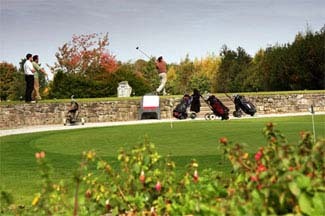 Ballinrobe Golf Club boasts a modern 300m deep, floodlit, 12 bay covered Driving Range.